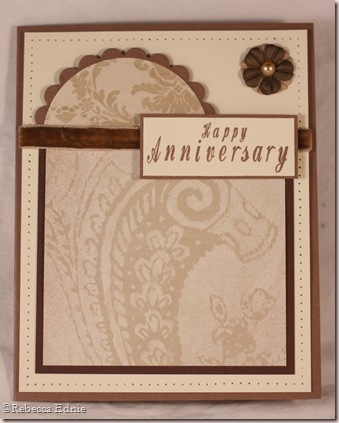 This card is so simple but it took AGES because I just couldn’t choose the paper sizes. The wording took a while to set up because I had to trim the letters to get the spacing to look right and to get the ‘happy’ to nest up to the ‘anniversary’ the way I wanted it to. The descending letters in happy interfered with the letters below. It was well worth trimming them though. I was inspired by a card from Jessica of The Whimsical Butterfly (link on sidebar). I think the result is very simple and and elegant. Hope you like it.